Khan Academy ’s mission is a free world-class education for anyone, anywhere, and the site has ten million unique visitors each month. During the past year, the art-history content alone was visited by every country in the world, save three, and Khan anticipates that this material will reach more than four million visitors during the fall 2014 semester. Khan Academy is a not-for-profit organization whose content is free and free of advertising. 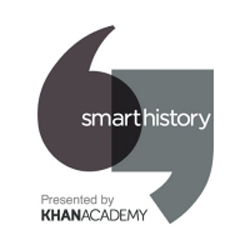 Smarthistory at Khan Academy seeks to bring the expertise of individual scholars and curators to a new global audience. In fact, Khan Academy is now partnering with select museums. And thanks to the nearly one hundred contributors that “claimed” topics and submitted essays during their first call in October 2013, Smarthistory has published close to ninety new essays. To get a sense of their vision, read Steven Zucker and Beth Harris’s recent post on the blog for AAM’s Center for the Future of Museums. If you are interested in sharing your expertise in the form of short introductory essays, Smarthistory could really use your help. The website’s founders, Zucker and Harris, seek art historians, archaeologists, and conservators in many areas of study; they have a particular need for specialists in African, Asian, precolonial American, and Pacific art. Together we can ensure that strong, global art-history content is well represented. Smarthistory has created an interactive list of topics, a Trello Board, with an eye toward supporting introductory art-history courses. If something critical is missing, please let Zucker and Harris know. Once you’ve decided on a topic, send an email to Zucker and Harris (along with your CV). If everything is in order, you will be added to the Trello Board, so that you can claim that topic. Essays are reviewed and edited by Harris, Zucker, and Smarthistory’s contributing editors. As a general rule, Smarthistory looks for the narratives a great professor tells his or her class in order to make students fall in love with the history of art. All accepted contributed content is published on both khanacademy.org and smarthistory.khanacademy.org. All content is published with a Creative Commons attribution noncommercial, share-a-like license. You remain the owner of your content, and your contribution is always attributed. 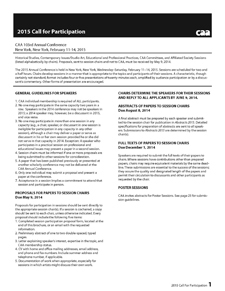 CAA invites individual members to submit abstracts for Poster Sessions at the 103rd Annual Conference in New York, taking place February 11–14, 2015. Poster Sessions—presentations displayed on bulletin boards by an individual for small groups—usually include a brief narrative paper mixed with illustrations, tables, graphs, and similar presentation formats. The poster display can intelligently and concisely communicate the essence of the presenter’s research, synthesizing its main ideas and directions. Colorado State University has published useful general information on Poster Sessions. Proposals are due on Friday, May 9, 2014—the same deadline as the regular call for papers for the 2014 conference. Send all materials to Lauren Stark, CAA manager of programs. A working group of the Annual Conference Committee selects Poster Sessions based on individual merit and space availability at the conference. Accepted presenters must maintain their memberships through the conference. Displays must be assembled by 10:00 AM on Thursday, February 12, and cleared by 2:00 PM on Saturday, February 14. Live presentations last ninety minutes and are scheduled during the lunch breaks on Thursday and Friday, 12:30–2:00 PM. During this time, presenters stand by their poster displays while others view the presentation and interact with the presenters. For more information about proposals of Poster Sessions for the 2015 Annual Conference, please contact Lauren Stark, CAA manager of programs, at 212-392-4405. 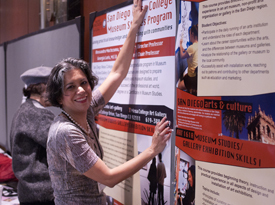 Alessandra Moctezuma of San Diego Mesa College preps a bulletin board for “San Diego Mesa College Museum Studies Program: Gaining Practical Knowledge and Connecting with Communities,” a poster session organized with her colleague Georgia Laris for the 2013 Annual Conference in New York (photograph by Bradley Marks). The 2015 Call for Participation for the 103rd Annual Conference, taking place February 11–14, 2015, in New York, describes many of next year’s programs sessions. CAA and the session chairs invite your participation: please follow the instructions in the booklet to submit a proposal for a paper or presentation. This publication also includes a call for Poster Session proposals and describes the seven Open Forms sessions. Listing more than one hundred panels, the 2015 Call for Participation is only available as a PDF download; CAA will not mail hard copies of this twenty-eight-page document. The deadline for proposals of papers and presentations for the New York conference is Friday, May 9, 2014. In addition to dozens of wide-ranging panels on art history, studio art, contemporary issues, and professional and educational practices, CAA conference attendees can expect participation from many area schools, museums, galleries, and other institutions. The Hilton New York is the conference headquarters, holding most sessions, Career Services, the Book and Trade Fair, ARTspace, special events, and more. Deadline: May 9, 2014. For more information about proposals of papers and presentations for the 2015 Annual Conference, please contact Lauren Stark, CAA manager of programs, at 212-392-4405. The 2014 Call for Participation for the 102nd Annual Conference, taking place February 12–15, 2014, in Chicago, describes many of next year’s programs sessions. CAA and the session chairs invite your participation: please follow the instructions in the booklet to submit a proposal for a paper or presentation. This publication also includes a call for Poster Session proposals and describes the seven Open Forms sessions. Listing more than 120 panels, the 2014 Call for Participation will soon mail to all individual and institutional members; you can also download a PDF of the twenty-seven-page document from the CAA website immediately. The deadline for proposals of papers and presentations for the Chicago conference has been extended to Monday, May 13, 2013. In addition to dozens of wide-ranging panels on art history, studio art, contemporary issues, and professional and educational practices, CAA conference attendees can expect participation from many area schools, museums, galleries, and other institutions. The Hilton Chicago on South Michigan Avenue (in the Loop) is the conference headquarters, holding most sessions, Career Services, the Book and Trade Fair, ARTspace, special events, and more. Deadline extended: May 13, 2013. For more information about proposals of papers and presentations for the 2014 Annual Conference, please contact Lauren Stark, CAA manager of programs, at 212-392-4405. 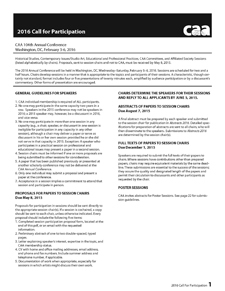 CAA invites individual members to submit abstracts for Poster Sessions at the 101st Annual Conference in New York, taking place February 13–16, 2013. Poster Sessions—presentations displayed on bulletin boards by an individual for small groups—usually include a brief narrative paper mixed with illustrations, tables, graphs, and similar presentation formats. The poster display can intelligently and concisely communicate the essence of the presenter’s research, synthesizing its main ideas and directions. Colorado State University has published useful general information on Poster Sessions. Poster Sessions offer excellent opportunities for extended informal discussion and conversation focused on topics of scholarly or pedagogical research. Posters are displayed for three days during the conference, so that attendees can view the work even when the authors are not physically present. Poster Sessions take place in a high-traffic area, in close proximity to the Book and Trade Fair and conference rooms. Proposals are due on May 4, 2012—the same deadline as the regular call for papers for the 2013 conference. Send all materials to Lauren Stark, CAA manager of programs. A working group of the Annual Conference Committee selects Poster Sessions based on individual merit and space availability. Accepted presenters must maintain their memberships through the conference. Displays must be assembled by 10:00 AM on Thursday, February 14, and cleared by 2:00 PM on Saturday, February 16. Live presentations last ninety minutes and are scheduled during the lunch breaks on Thursday and Friday, 12:30–2:00 PM. During this time, presenters stand by their poster displays while others view the presentation and interact with the presenters. For more information about proposals of Poster Sessions for the 2013 Annual Conference, please contact Lauren Stark, CAA manager of programs, at 212-392-4405. CAA invites individual members to submit abstracts for Poster Sessions at the 100th Annual Conference in Los Angeles, taking place February 22–25, 2012. Poster Sessions—presentations displayed on bulletin boards by an individual for small groups—usually include a brief narrative paper mixed with illustrations, tables, graphs, and similar presentation formats. The poster display can intelligently and concisely communicate the essence of the presenter’s research, synthesizing its main ideas and directions. Colorado State University has published useful general information on Poster Sessions. Proposals are due May 2, 2011—the same deadline as the regular call for papers for the 2012 conference. Send all materials to Lauren Stark, CAA manager of programs. A working group of the Annual Conference Committee selects Poster Sessions based on individual merit and space availability. Accepted presenters must maintain their memberships through the conference. Displays must be assembled by 10:00 AM on Thursday, February 23, and cleared by 2:00 PM on Saturday, February 25. Live presentations last ninety minutes and are scheduled during the lunch breaks on Thursday and Friday, 12:30–2:00 PM. During this time, presenters stand by their poster displays while others view the presentation and interact with the presenters.